14ymedio, Havana, 8 May 2017 — Activist Rosa Maria Payá denounced Monday the arrest of three coordinators of the CubaDecide initiative in Matanzas. The opponents were arrested early in the morning as they headed to Jose Marti International Airport in Havana to welcome Payá, who is promoting the campaign for a plebiscite on the island. The dissident, who lives between Havana and Miami, said that Sayli Navarro, his father Félix Navarro, and Iván Hernández Carrillo, were “kidnapped” by State Security agents when they left their homes in the Matanzas towns of Perico and Colón, respectively. Last February, Payá organized the presentation of the Oswaldo Payá Liberty and life Award, which bears the name of her father and to which she invited Secretary General of the Organization of American States (OAS) Luis Almagro, former Mexican President Felipe Calderón and former Chilean minister Mariana Aylwin, among others. 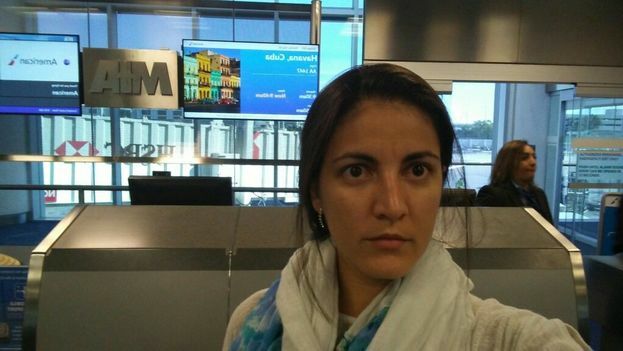 The Cuban government prevented two of the guests from taking flights to the country and denied the OAS leader a visa. The governments of Chile and Mexico demonstrated their disagreement with the measure taken by Havana. Several activists associated with the event were arrested on the island, while the police restricted the movements of numerous independent journalists to prevent them from covering the ceremony. Payá is not part of the Christian Liberation Movement founded by her father and is promoting the holding of a binding plebiscite for Cubans to decide on what system of government should govern in the country.